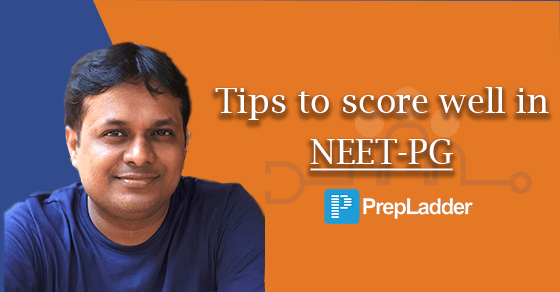 Last few days tips to Score well in NEET-PG! NEET-PG is just a few days away. This is the time when all of you might be busy wrapping up your studies This is indeed the most crucial time for all PG aspirants. Every minute, to be more precise, every second you lose can cost you a seat. It requires rigorous efforts to be put into your preparation. Dr. Vivek Jain is here with the last few days tips to score well in NEET-PG based on his own experience. *0. Make a Revision timetable for all 19 subjects*: Take one subject at a time *OR* 1 Major + 1 minor as per your comfort level. *1. Start Revising*: Don't try to finish each subject 100%. No one can. Start Revising even if a subject is 80-90% Completed. *2. Revise Class notes 6-8 times*: Whatever you find new or extra, write/ stick-on notes itself. *3. For NEET-AIPG, Start reading National Board Questions 2012-June 2018*: Focus on one-liner mcq more. *For AIIMS*: Do focus on topics asked in last 6 papers. *4. Daily practice minimum 100 questions (Any subject/ Mixed) keeping Watch with 60 minutes time*: Take no break, Mark answers on a sheet of paper, Later check answers. Mark wrong answer with a Marker pen, to be revised later. Keep on increasing time devoted to MCQ gradually as Exam date is nearing. 3-4 weeks before the exam date, more than 80-90% time of a day must be devoted to questions. *5. Do not waste too much time on Online mcqs only instead devote time to standard popular McQ books*: Most of MCQs on some online platforms have been taken from USMLE books to impress. No such mcqs come in National board exams (DNB, NEET AIPG). *7. Trust your hard work, efforts and knowledge* No harm in giving some time (max half day in a week) to family, friends or hobby. It helps you relax and be fresh for studies again. *8. If you haven't read a subject at all till now, Do Not leave it*: At least learn it once through Mobile app video lectures (if available for a popular faculty on Google play store) and at least practice 500-800 MCQs for that subject. *10. Leave Facebook/ WhatsApp till Exam day*, if possible. It'd confuse you and waste your time. If not possible, check WhatsApp not more than once-a-day (Max 10 minutes). In last 14 years, I have never seen or met a Topper who was active on social media. After exams, join back Social media. 1. Whatever books you have been reading since the start, Continue. Don't change much at this stage. New books to be used if you want to practice more MCQs. 2. For those reading books written by me: Do read all Annexure and Golden Points subject wise for NBE. It'd help in faster revision before exams. 3. Try to get a minimum 6-7 hours sleep every day. The app includes video lectures covering the entire PSM, Tests with Video Discussion, Question Bank, Free daily updates and much more. Best Wishes for upcoming NEET!